My Weekly Indicators post is up at XE.com. The near term forecast remains very strong, but there are crosscurrents among the long leading indicators. 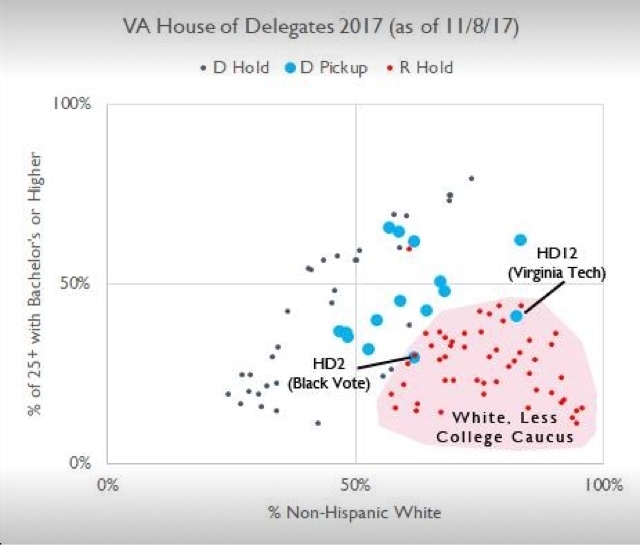 Two thoughts on the Virginia election: it's the net strong disapproval,stupid! But is the primary driver education or age? It's a slow week for economic news, but we sure had some electoral fireworks on Tuesday! Since I am a data nerd, here are two metrics from Virginia that caught my attention, which I'll discuss in reverse order. I. Is it education or is it age? Republicans were completely shut out in districts with less than 50% white populations. With one exception, they were also shut out in majority white districts with more than 50% holding college degrees. On the contrary, the GOP won all but two districts with more than about 55%-60% white population where *also* less than 40%-45% hold college degrees. Senior citizens voted for Gillespie. Middle-aged adults split almost evenly between the two candidates. The younger than 45 you got, the bigger the share for Northam. It's pretty clear that there are strong red-blue divides along the axes of age and education. Not only have I not seen this issue addressed for the Virginia vote earlier this week, I still haven't seen it addressed for last year's Presidential election! This has serious electoral implications. If the primary driver is age (as in, those who formed their political opinions before the Civil and Voting Rights Acts of 1964 and 1965 were passed), well then (ahem) mortality will take care of the issue. If it's education, the critical divide is going to persist, albeit with less intensity. 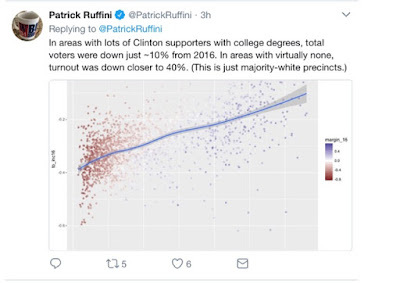 My guess is that education is the stronger driver, a point brought home by one of the Trump supporters in Johnstown, PA, re-interviewed by Michael Kruse recently, who lamented that all of the young people with prospects had moved away (probably to a growing metropolis where they were voting Democratic). But I'd like to see the data! 2. It's the net strong disapproval, stupid! Regardless of the answer to the first question, there is one metric that forecast the outcome of the Virginia election very well: net strong disapproval minus strong approval. I like K.I.S.S. methods, and I have decided that the easiest K.I.S.S. guide to the midterm elections is likely to be Rasmussen's "net strong disapproval" spread. The theory is that while voters who even weakly approve or disapprove of a President are likely to come out and vote in the Presidential election years, only those with strong opinion -- a substantially smaller number -- come out to vote in midterm elections. [O]n Election Days 2010 and 2014, for every 100 adults who strongly disapproved of Obama, there were only 60-65 and 55 adults who strongly approved of his performance -- enough for a GOP wave in each case. There is one important difference, though. 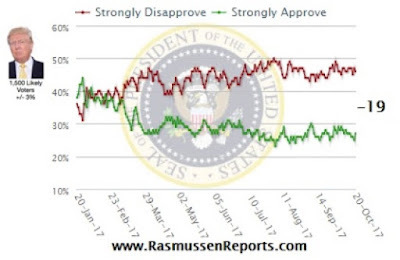 At its worst, strong disapproval for Obama was only about 40%, with strong approval languishing just under 20%. For Trump, both numbers are about 10% higher -- he has both bigger strong disapproval (45%-50%), and bigger strong approval (23%-29%). If strong opinions drive off-year turnout, then we should expect to see bigger turnout for both the party in national power as well as the party out of power. [T]his was an intensity surge for Democrats more than it was a falloff for Republicans: while it’s not exactly an apples-to-apples comparison because there was a bigger third party vote in 2013, Gillespie got about 160,000 more votes than Cuccinelli did four years ago. But Northam got 335,000 more votes than outgoing Gov. Terry McAuliffe (D). Turnout increased for *both* GOP and Democratic voters, but comparatively the turnout was much, much higher on the Democratic side. This gives me confidence that I am on the right track using this metric to forecast the midterms. In other words, if one year from now strong disapproval vs. strong approval is about where it is now, almost every GOP officeholder in a jurisdiction or district that was carried by Hillary Clinton in 2016 is Doomed. Of course, approval vs. disapproval numbers can and do change with time and events. But it seems very unlikely that Trump is going to be less polarizing a figure one year from now than he has been for the last two years. Which means that either war and/or changes in the economy are the likely determinants of meaningful changes in net strong disapproval between now and then. I have no clue what might transpire on the international scene, but forecasting the economy one year out is right in my wheelhouse. I'll address that shortly. The underlying trend in inflation is driven by the laws of supply and demand, which are as applicable today as they ever were. Excess demand pushes inflation up; excess supply pushes inflation down. Central banks exploit this relationship, working to create excess demand or excess supply in the economy, to target the inflation rate. A central role in this relationship between the economy and inflation is played by inflation expectations. The more anchored those expectations are, the more quickly the economy will find its way back to normal after an economic shock. This is known as the credibility dividend: a credible central bank will see inflation expectations well anchored at the target level and will have a relatively easy time restoring normality after a shock. What this means is that the underlying trend in inflation may become more stable as expectations become more anchored. In short, the more successful the inflation target is, the less obvious the relationship between economic shocks and inflation will become. The top chart shows the 5-year breakeven inflation rate while the bottom chart has the 10-year breakeven rate. Both are actually a bit lower now than at the beginning of the expansion. The top chart shows the PCE implicit price deflator -- the Fed's preferred inflation gauge. The bottom chart shows the Dallas Fed's trimmed mean PCE inflation gauge, which removes extreme movements from the index, reasoning that these are short-term deviations from a longer-term norm. Both measures have flummoxed the Fed as they have failed to hit their 2% target. But the recent weakness in inflation expectations is probably contributing to this lower level of price pressure. Income is central to my investment philosophy. Dividends help to mitigate risk, provide return when the overall market is stagnant, and provide income for reinvestment. I follow a group of stocks that have a long history (25+ years) of raising dividends. When a company is at or near 52-week lows, I look at the company's financials to determine if it is still a viable investment. I detail this process in more detail in my book, The Lifetime Income Security Solution. After gapping lower at the end of August, HRL consolidated losses between 30-32. 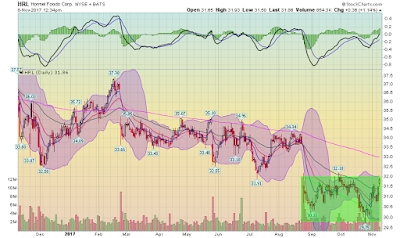 It is currently at the upper end of its recent trading range. The MACD indicates momentum is shifting, implying a fair amount of upside potential. Hormel Foods Corporation, a Delaware corporation (the Company), was founded by George A. Hormel in 1891 in Austin, Minnesota, as Geo. A. Hormel & Company. The Company started as a processor of meat and food products and continues in this line of business. The Company’s name was changed to Hormel Foods Corporation on January 31, 1995. The Company is primarily engaged in the production of a variety of meat and food products and the marketing of those products throughout the United States and internationally. Although pork and turkey remain the major raw materials for its products, the Company has emphasized for several years the manufacturing and distribution of branded, value-added consumer items rather than the commodity fresh meat business. The Company has continually expanded its product portfolio through organic growth, new product development, and acquisitions. While this is certainly not the most exciting business, it is a necessity, which provides protection in weaker economic environments. There is also a large amount of competition in this space. Hormel's primary advantage is size, which means it not only has economies of scale but the ability to simply out-muscle or purchase competition. Hormel's financials (from Morningstar.com) are very encouraging. Balance sheet: unlike other companies I've profiled, HRL has a nearly 2:1 current ratio. While total assets have increased over the last five years, most of the increase comes in goodwill, a highly subjective concept. But intellectual property has also increased, which means the company has been investing or buying new products -- an encouraging sign. Total long-term debt is minimal for a company this size. Finally, shareholder equity has increased from 61.78% in 2012 to 69.83% in 2016. Cash flow: HRL has refunded a lot of its existing debt over the last five years, while also engaging in a stock repurchase plan. Like other large companies, HRL can fund their PPE expenditures from cash flow. Income Statement: here there is good and bad news. On the good side, the company has expenses under control. Over the last 5 years, the gross margin increased 649 basis points; operating income was up 461 bps, while net income increased 327 BPs. This is fortunate because top-line revenue growth has been slowing. The three-year average has declined from 6.6% to 2.8% over the last 4 years. Finally, according to Finviz.com, the current dividend is 2.16% with a payout ratio of 38.2%. Overall, this is a solid company. The balance sheet is pristine. They have adequate cash flow and expenses are under control. At these levels, Hormel is worth a look. This post is not an offer to buy or sell this security. It is also not specific investment advice for a recommendation for any specific person. Please see our disclaimer for additional information. Take yesterday's JOLTS report with an extra grain of salt, as it was affected (particularly in the South census region -- more on that later) by Hurricanes Harvey and Irma. That being said, the disconnect between the "soft data" of openings in this survey and the "hard data" of actual hires and discharges continues. As I have pointed out many times, openings can be just chumming the water for resumes, or even laying the groundwork to hire foreign workers. The disconnect betrays an unwillingness to pay new hires more, or to engage in on the job training. The "soft data" openings have remained very close to their high of one month ago, while quits are down a little more (about 2%) from their recent highs, but hires are down significantly from their recent high (about 7%) and up only slightly (less than 1%) from one year ago. Meanwhile layoffs and idscharges declined significantly compared with the last several months, but remain substantially higher than they were one year ago. There is nothing in yesterday's data that portends any imminent recession, but on the other hand, it continues the slew of data that says we are late in the cycle. In addition to my economic cycle paradigm of long and short leading indicators, I also have several "fundamental" systems to corroborate the result. Onr of those, focusing on producer vs. consumer prices, is flashing a yellow caution signal. This post is up at XE.com. This book provides a straightforward methodology to achieve and protect your financial goals. It not only explains why an income-based investment strategy is superior to active management but also how to utilize certain deferred compensation strategies to better time income recognition. Finally, there is an overview of a simple and realistic asset protection methodology that relies less on hype and more on an honest appraisal of asset protections true capabilities. Concise and conversationally written, this book is a must for high net worth individuals and investment advisers. I'm a financial adviser with Thompson Creek Wealth Advisers, where I manage money for individuals and captive insurance companies. My tax practice is centered around captive insurance. I'm the author of the book U.S. Captive Insurance Law (which is also available on Kindle), the leading book in the field. You can learn more about captive insurance at my website. I also practice law in the areas of estate planning, asset protection and international taxation. I'm on Linked In and Twitter (@captivelawyer). Silver Oz's Linked In name is @silver_oz. NDD is a fossil and may be reached by etching a picture in stone on the wall of a cave. Cash or Bonds at Low Yields and a Flat Yield Curve? Are There Unwanted Pests in Your Attic? This blog contains opinions and observations. It is not professional advice in any way, shape or form and should not be construed that way. In other words, buyer beware.